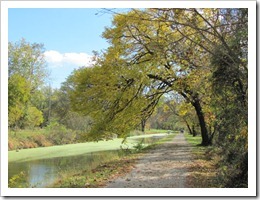 The other day, my Wiccan meetup took a hike along the C&O Canal. The leaves are in their full glory, and it makes for such a nice walk. Its even ground. People you meet are so often friendly with a smile and hello, and you can see quite a bit of wildlife thriving down there too. 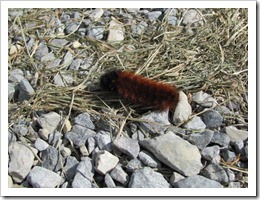 We found at least 12 Woolley Bear Caterpillars crawling around. There are the larvae babies to the Isabella Tiger Moth, and most well known for the tradition of predicting winter weather. Supposedly, the black represents cold and bad weather, while the brown represents warm weather. Its an odd superstition. I think they’re just cute. 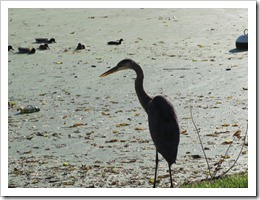 Check it out; a Great Blue Heron. This guy was so close to the parking lot, and in this photo he’s keeping an eye on a young Rottweiler puppy that’s watching him. 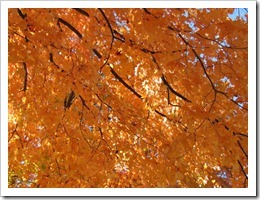 And the leaves are just breathtaking in all their colorful glory. An interesting thing people may not realize is that these color are always present. The green Chlorophyll covers it up, and while the green dissolves in the Autumn month, revealing the brilliance below. I also got a new Iphone 4S for my birthday. Its awesome. The camera is better, and includes both front and back facing cameras (that includes video), as well as the usual apps. It also includes Siri, which is the AI that can do many hands-free services such as looking things up, calling contacts, sending emails, posting to Facebook, and so much more. I love my gadget! Further updates includes looking into ideas for potentially getting some sort of career. I’m thinking of maybe C.N.A. or maybe book editor. I’m still exploring options. I also celebrating my 45th birthday. Ugh@ growing old, but yeah for birthday cake. I ate way too much, had lunch with my mother, got calls from other family members, met up with some sisters, and my husband made lots of Halloween-themed foods for dinner. Danny made me a card, and got me a Nutella snack thing. Nutella, if you don’t already know, is tasty heaven. Its chocolate/hazelnut cream stuff you eat straight or add to coffee, bread, cookies, etc. Omg, its so good. Its been a running joke with my son that when we go to the store, he will stand in front of the Nutella, arms wide, and tell me to ‘stay back’. lol Trying to save me from myself, I suppose.